Noah Johnson has a mythical legacy of charging. On January 1, 1999, he became the youngest winner (the Hilo native was 25 at the time) of the Quiksilver in Memory of Eddie Aikau Big Wave Invitational, taming wild and woolly Waimea Bay that stormy day. The regular foot earned $30,000 for the win and a perpetual invitation to “The Eddie.” Noah is not only a giant pair of balls–he’s also a brain. 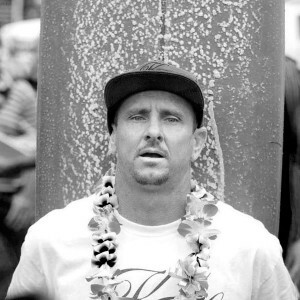 After professional surfing, he attended the University of Hawaii at Manoa and earned bachelor’s degrees in Economics and Political Science with a minor in Art. He wants to use his higher education to pursue a career that is “moving forward in a positive way and not just thrashing the environment and burning people left and right.” Since “The Eddie” victory, Noah Johnson still surfs giant waves for fun and channels his courage and disregard for danger as a stunt man. Currently, he is a regular on Hawaii Five-O and performs stunts on big, budget Hollywood films like Battleship and Chasing Mavericks.